BAK4 prisms, with highest-quality broadband multi-coatings. 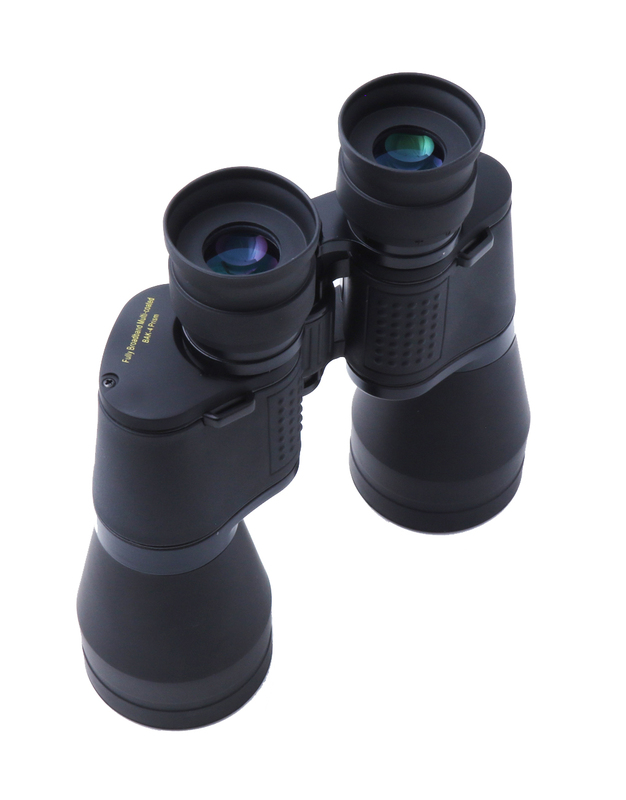 A great multi-purpose binocular, available in your choice of 8x or 11x magification. We believe these are the highest-quality binoculars you will find for less than $100. Includes the finest BAK4 prisms and is fully broadband multi-coated throughout. 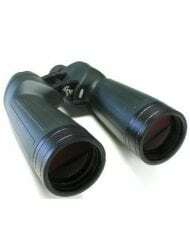 The bright, wide 6° field of view makes these ideal for binocular astronomy. Our 56mm objectives gather 25% more light than 50mm binoculars (surface area = pi*r2). 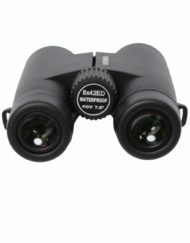 They are also excellent for general daylight usage, birding, and nautical applications. Both models offer a steady view without a tripod, but of course the 8x model is easiest to hand-hold. The high degree of eye relief and fold-down eyecups makes these models a great choice for those that wear eyeglasses. Heavily rubber-armored aluminum body, with brass 1/4-20 tripod adapter threading. Also includes right ocular diopter adjustment, soft rubber ocular cover, attached soft rubber objective covers, rugged nylon case, and our premium heavy-duty denim strap. New for 2018, the prism covers in between the body and the objective tubes are now aluminum, to more rigidly hold the objective tubes in perfect alignment. Oh- and we lowered the price- now just $89.95! 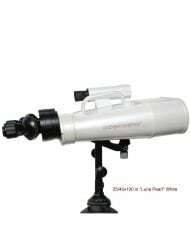 These are the best handheld astronomy binoculars I’ve used. 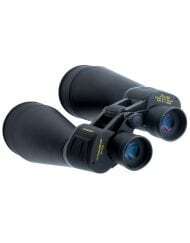 I’m comparing them to Orion 7×35, Nikon 10×50, and Oberwerk 15×70’s, all fine binoculars with unique advantages, but these 8×56 binoculars are the best for handheld use. 15×70’s show much more depth and detail, but they require a tripod and parallelogram mount, too much gear and hassle if I’m traveling or just want to step out into the back yard for 15 minutes. 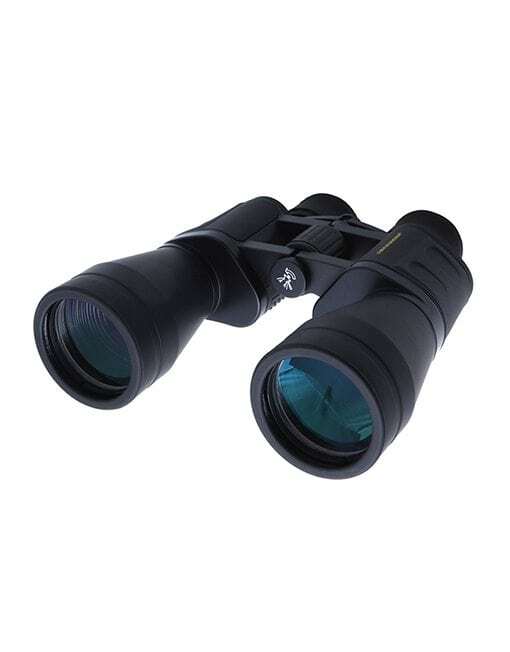 These 8×56 binoculars give clear, sharp, bright images, with a wide field of view. The focus is firm and precise, with almost no drift. There is a little bit of distortion and chromatic aberration right at the edge of the field, but otherwise the image is true, and with the wide field of view the “sweet spot” is big and forgiving. I wear eyeglasses, so I appreciate the long eye relief. Compared to 10×50’s, the slightly bigger 56mm aperture really does gather noticeably more light, making it possible to see fainter deep sky objects, even at a lower magnification. Overall construction is solid and seem quite durable. I had to clean one of the objective lenses after it was nuzzled by an enthusiastic labrador retriever, and the lens seemed to survive cleaning with an opticloth without apparent damage to the coating. In contrast to the high quality of the binoculars themselves, the accessories leave much to be desired. The single “Fujinon style” ocular lens cover is so loose it falls off just taking the binoculars out of the bag. Totally useless. The objective lens covers are also a bit loose and fall off easily. The bag is rather cheaply made, and I’m not crazy about either of the supplied neck straps. 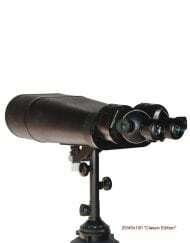 Aside from these complaints about the lens covers, bag, and straps, this is a fine pair of binoculars, light enough for handheld use, with excellent optics, and big enough to reveal many wonders of the night sky. shadowed areas open up as if someone put a spotlight on your subject. 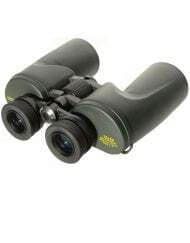 Very nice for viewing birds in wooded areas. Maybe a bit heavy (2.2 lbs.) 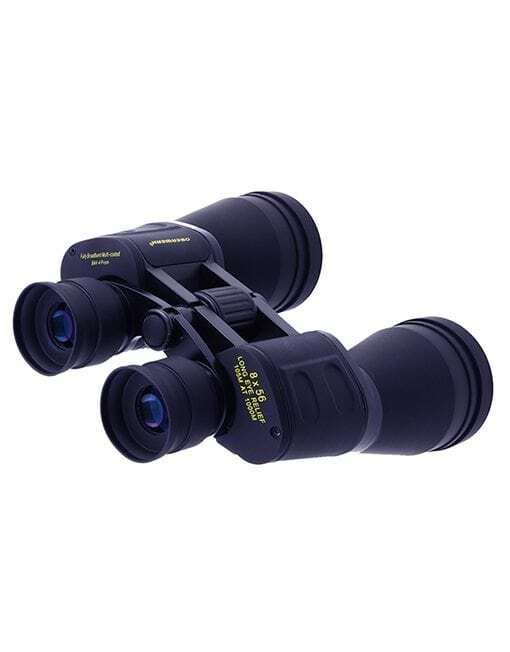 for casual use, but if you want binoculars for low light conditions, these are great! Actually, I bought the 11X56 model rather than the 8. I’ve since taken the bino out for some astro work, and I’m more than just impressed. Optically, this bino is much better than the Skymasters. Star images are much brighter and sharper, even though the apertures are smaller–proof that aperture isn’t everything. The quality of the glass and the coatings make the difference. The FOV appears to be a bit smaller than advertised, but I can live with that; it is still enough to get all of Orion’s Belt and the Sword as far as M42. Also enough to get nearly all the Hyades in a single view. The view of M45 is almost telescope quality–it really is that good. As for chromatic aberration, yes, there is some, but it’s not prominent. On bright stars such as Vega and Sirius, it’s almost invisible; on the Moon, only a subtle purple haze, not enough to degrade the view. Aldebaran’s red hue is clearly visible, with no visible CA. On the Moon, the contrast between light and dark areas is excellent, the edge sharp, and, the large craters easily visible. Even the soft glow of earthshine on the dark side is easily seen. Anything to dislike? So far, nothing at all. This is really a well-made instrument–100-dollar price, 200-dollar (or more) performance. Highly recommended. Very happy with my purchase! Very fast service, I ordered them Wednesday night, and received them Friday morning. They were packaged very well, plenty of padding, and “caution: fragile instrument” stickers on the box. 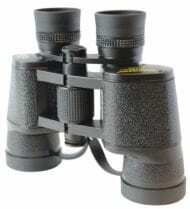 The binoculars (8×56) seem sturdy and well made. I took them outside last night in my light-polluted area, and pointed it at Orions belt. Where with my naked eyes I could see 6 stars, with the binoculars I could see what seemed like 1,000 stars. You can see a lot of detail on the moon, lots of craters and a very crisp clear image. I haven’t had the chance to look at planets yet, but am looking forward to it. I received the 11×56 LW’s today and just got a chance to use them under the stars before clouds rolled in. I just wanted to shoot you a quick note and thank you for the easy ordering process, quick shipping, and great product. I’ve bought a couple other binoculars in the same price range and with both the alignment was off out of the box. The alignment on the LW’s was dead-on. I couldn’t be happier, and I’ll definitely be ordering from you again when the time comes for new binoculars (which will likely be soon, I’ve been eyeing some of the larger models). 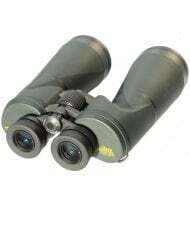 Thank you, and I’ll definitely be recommending you company to anyone looking for solid binoculars and great service.